The U.S. housing recovery and expansion showed signs of slowing, although home prices continued to far exceed overall inflation in August, according to the S&P CoreLogic Case-Shiller home price index. The 12-month price increase among 20 cities was 5.9%, down from 6.4% in July and the lowest year-to-year gain in 11 months. A housing economist with Standard & Poor’s noted widespread declines in home price increases as affordability has worsened. The 20-city index was up 59.4% from its 2012 low point and 3.5% above its pre-recession peak. The Conference Board said consumer confidence rose in August, nearing an 18-year high set in February. Enthusiasm for current conditions remained heightened, and expectations rose for the coming months. The business research group said the index suggests economic growth exceeding 3% for the rest of the year with healthy consumer spending for the holidays. 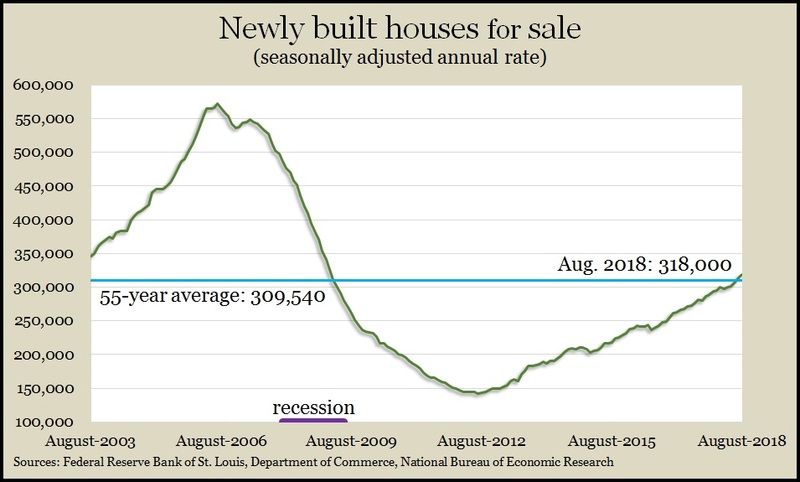 New home sales rose 3.5% in August to 629,000 houses, the Commerce Department reported. The annualized sales rate was a 12.7% increase from August 2017, suggesting continued activity in the housing market despite rising mortgage rates. The median sales price rose 1.9% from the year before. In an encouraging sign on the inventory of residences for sale, the number of new houses on the market rose to the highest level since the recession, although it was still 56% below the 2006 peak. Durable goods orders rose 4.5% in August, boosted by a surge in demand for aircraft. Excluding the volatile transportation category, orders rose 0.1%. Year-to-year, orders overall gained 9.2%, with an 8.2% rise excluding transportation. An indicator for business investment increased 7.4% from August 2017. Continuing to complain that low housing inventories are hampering the real estate market, the National Association of Realtors said its pending home sales index sank in August for the fourth time in five months. The index fell 1.8% from July and was down 2.3% from August 2017, the eighth consecutive year-to-year decline. An economist for the trade group lowered forecasts for 2018 sales to 5.46 million existing houses, which would be 1.6% fewer than in 2017. The Realtors project 2019 sales to rebound 2% from 2018. The U.S. economy grew at a 4.2% annual rate in the second quarter, the fastest pace since mid-2014, according to the Bureau of Economic Analysis. The final estimate of the quarter’s gross domestic product was unchanged from the previous report, with consumer spending rising at a 3.7% annual rate. Inventories were lower than in the earlier estimate, and the pace of housing investments remained a drag on the economy, but commercial investments, exports and government spending accelerated. The Federal Reserve Board’s favorite measure of inflation came in at 2.1%, down from a 2.2% estimate earlier. The four-week moving average for initial unemployment claims rose for the first time in six weeks, remaining near the lowest level since late 1969. According to data from the Labor Department, jobless applications have been below the 51-year average every week since early 2013, indicating that employers are cautious about letting workers go. The Bureau of Economic Analysis said personal spending rose 0.3% in August, the slowest growth since February. Personal income also rose o.3%, so the personal saving rate stayed at 6.6%. Year-to-year, consumer spending rose 3% in August, the highest since early 2016. In the same report, the Federal Reserve’s favorite measure of inflation showed a 2% year-to-year increase, its fourth month in a row at the target level. Before May, the U.S. economy hadn’t supported 2% inflation since 2012. The University of Michigan consumer sentiment index declined from its mid-September estimate but eclipsed 100 for only the third time since 2004. Consumers say they expect improved personal finances in the year ahead as well as continued economic growth. Nearly one-third of respondents cited tariffs as possibly having a negative impact on the economy. A University of Michigan economist said the high sentiment should mean consumer spending rising 2.6% on average through mid-2019.